Matudnila.com - A Cebu Events Blog: Jollibee is giving Free Amazing Aloha Burger in 35 stores Nationwide today! Home Regular Yum Jollibee is giving Free Amazing Aloha Burger in 35 stores Nationwide today! Jollibee is giving Free Amazing Aloha Burger in 35 stores Nationwide today! 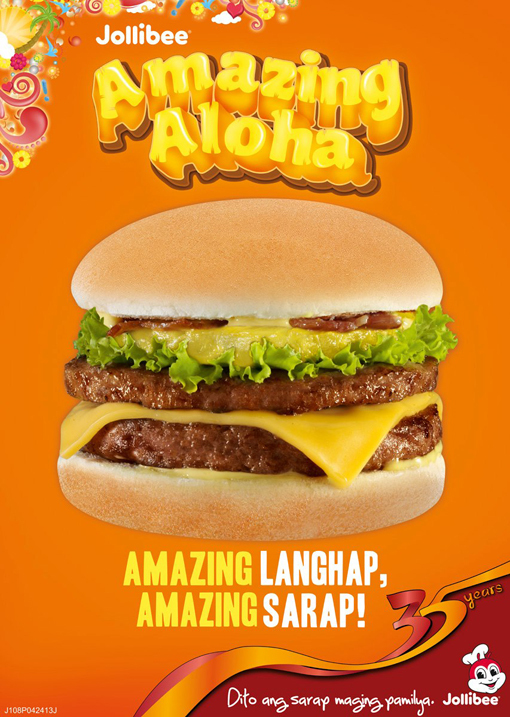 Since its Jollibee's 35th year, Amazing Aloha Burger is back! Starting today, Amazing Aloha Burger will be available for a limited time only. Way back 2006, Amazing Aloha Burger is introduced as an extraordinary burger experience of two burger patties, crispy bacon bits, cheese and lettuce doused in honey mustard dressing topped with a fresh slice of pineapple sandwiched between two soft buns. Amazing Aloha Solo is priced at P 99 and P 135 in a value meal with regular fries and drink. Since its Jollibee's 35th year anniversary, Jollibee will be giving 100 FREE Amazing Aloha Burger in 35 stores nationwide starting at 3PM! In Cebu, 2 Jollibee Branches: Jollibee Parkmall and Jollibee Mango will be giving 100 Amazing Aloha Burgers for FREE! 0 comments: on "Jollibee is giving Free Amazing Aloha Burger in 35 stores Nationwide today!"